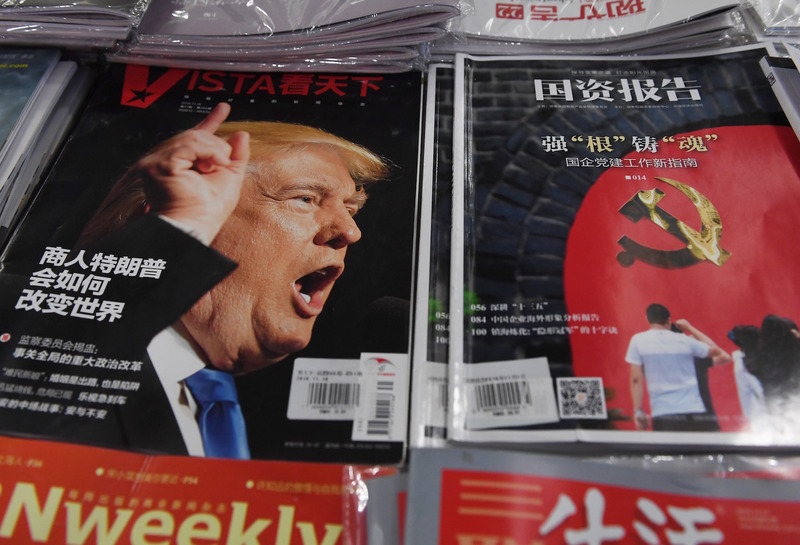 ‘How Will Businessman Trump Change the World?’ reads a magazine cover at a Beijing bookstore, December 12, 2016. President-elect Donald Trump’s rhetoric suggests he will push China on many issues, not just one. Some observers have held on to the hope that his phone call with Taiwanese President Tsai Ing-wen, his burst of anti-China tweets, and his most recent musings on Fox News Sunday questioning the “One China” policy actually represent a smart post-election but pre-inauguration strategy. This is wishful thinking, considering how Trump’s brash style has hardly changed over the last 18 months. Trump will not only push but offend and rile China. He believes poking the dragon is part of dealmaking, but it also means that he will be opening up a complicated, multi-front battle with the Chinese. Faced with the inevitability of Trump’s desire to shake things up with China in a way that no Republican or Democratic administration has in years, and considering the many disputes Trump has already raised, I would like to see the next administration speak up more strongly against China’s human rights record. Of course, there’s the problem inherent in Trump saying anything about human rights: Everyone from Dan Rather to Russia’s former foreign minister, Andrei Kozyrev, has called out Trump’s autocratic tendencies. I submit these proposals understanding that paradox, and also the U.S.’s own failure at times to lead by example, but believing that regardless of the administration, the United States should push China harder on human rights. It’s a familiar point of contention that tends to put China on the defensive, however momentarily. It is also the right thing to do. As Al Jazeera English’s correspondent in Beijing, I reported on the country’s heightened restrictions on civil liberties in the years following the 2008 Beijing Olympics. From stories of secret prisons called “black jails” to protests by aggrieved farmers, many people in China suffered from living in a country with corruption and weak rule of law. The picture has only grown more dismal since I left. Advocating that human rights should be where the U.S. starts pushing back might seem strange considering greater geopolitical pulls, but it’s precisely because human rights gets so frequently overlooked in these conversations that I’d like to propose that Trump prioritize it. Rights activists, including Nicholas Bequelin at Amnesty International, increasingly have called for more vocal diplomacy than the usual private form. There are some fairly easy ways Trump can start. The Dalai Lama has expressed interest in meeting Trump, and that should be arranged. Over the past decade, China has further tightened control over Tibetans’ lives, including at their monasteries. The Dalai Lama’s last visit to the White House was this past June. Trump’s team should arrange a visit early on in the presidency to reaffirm U.S. support of His Holiness’ “middle way,” which calls for more Tibetan autonomy but not full independence from China. Xi Jinping’s anti-corruption campaign has extended beyond China’s borders. Sophie Richardson of Human Rights Watch suggests that countries should stop cooperating with China on the matter—including the extradition of citizens—until, for example, the country adopts greater due process. She also proposes freezing the overseas bank accounts of Chinese officials with records of human rights abuses. These would be new and tougher measures—and possibly attractive ones for a president who loves quid pro quo dealmaking. Richardson also points out “Beijing’s dislike for public embarrassment.” She probably did not have Trump in mind, but perhaps a bully like him can tough-talk the Chinese and integrate human rights into negotiations. The danger, of course, is how Trump’s words might push China over the edge. Already, The Global Times has accused Trump of forcing China closer to a military takeover option of Taiwan. If Trump next attacks China on human rights, his temperament could well take things too far.